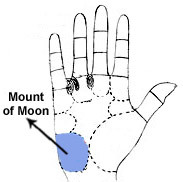 The mount of Moon lies in our hand opposite to thumb,lower and towards wrist. In palmistry it's said to be associated with imagination, art and excitement. Let's see what type of effect it has on the lives of people. People who have the moon mount developed they are good hearted, beautiful with soft heart and are sensitive. If the moon mount is very risen then a person tends to be very agile and get onto problems due to their impatient behavior. If the moon mount is suppressed then a person keeps on thinking and doesn't stop and is also emotional. Due to them getting lost in their imagination they suffer delay in their work.